I'm joining Tracy McNeely for her annual 25 Days of Christmas Tags event. There are different sponsors for every day of the event - today, we're showing off our best Neat and Tangled tags. I used the bunny from Holiday Baking, and gave him a stocking (from Elfs and Their Shelf) to hold. I used the Journaling Alphas dies to cut out a huge "to." I love how skinny those letters are! I doodled in a little sweater for him, and I kind of love it. I used the same tag shape, and added the Stitched Slopes to give him some bunny hills. The sentiment is from Merry Kisses. The tag base was inked up with a Distress Oxide ink and then I splattered large droplets of water onto it. geez. Now I feel like I want more Distress Oxide inks. This color is Salty Ocean. What are other must-have colors? I hope you liked my tags, and thanks for stopping by! SO CUTE! I LOVE these adorable bunny images and the amazing color too! Cuteness overload! Love your sweet tags, Elena!!! The plaid is amazing and colouring of both of your tags is adorable!!! OMG - so adorable! I'm caring for my daughter's bunny. I for sure have to make something like this for my Christmas tags! Thanks for the inspiration! Super cute bunny tags Elena, I like both designs however the large "TO" on the first one is a great idea. Oh, Elena...your tags are FABULOUS. You are so creative, and I've really enjoyed seeing your creative touches. 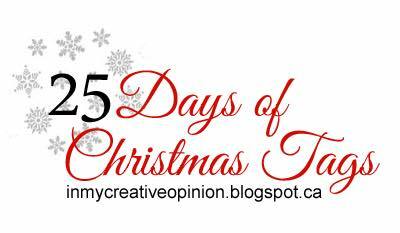 Thanks for inspiring us all in the 25 Days of Christmas Tags. Keep up the fabulous work. I love seeing it. Your tags are absolutely adorable !! The bunnies are so cute. Love the little naked bunny. the sweet li'l one with that plaid.....soo much luv!!! Both of your tags are so cute and beautifully done. Love the buffalo plaid with the big TO, great idea, thanks for sharing it! These tags are both so sweet! 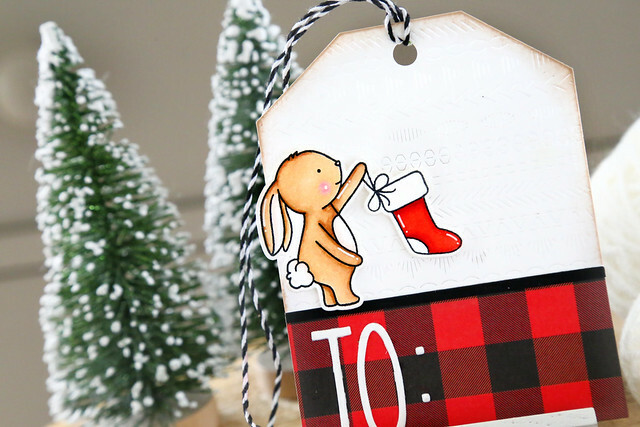 I love the expression on that cute little bunny holding up the stocking, and the white sentiment on top of the plaid paper looks terrific! Love the layout of your skiing bunny too! Thank you for the beautiful holiday tag inspiration! Very sweet images for these tags! Your skiiing bunny looks darling in his sweater, and I adore the buffalo plaid tag. You are the one that convinced me I needed those skinny alphas in my life. I love them, too. Both of your tags are so sweet! I love how the different critters in different Neat and Tangled sets can all be mixed and matched to hold different items and how they all work so well together! 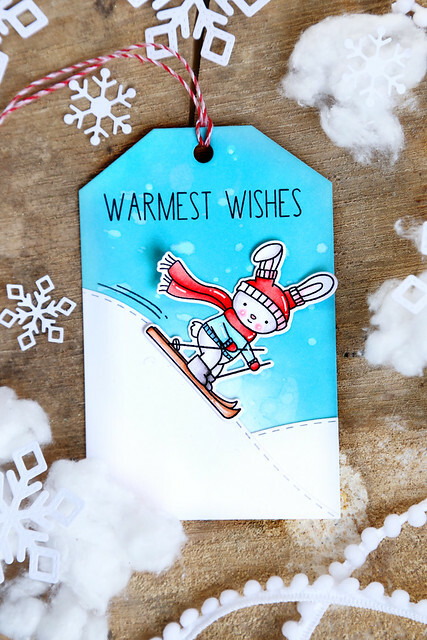 Your bunny from Holiday Baking and the stocking from Elves on a Shelf proves that because your tag looks so cute! The brand new bunny skiing on that steep slope is super cute, also! Bunnies were the perfect choice. Love your tags, they’re adorable. Your tags are darling! I used your skiing tag as the inspiration for my tag today! 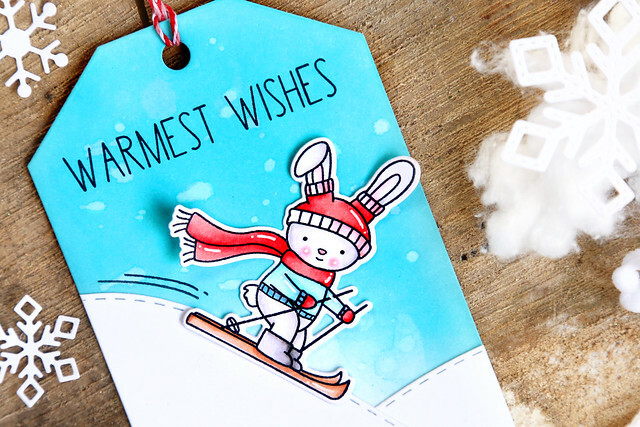 love this cute bunny tag!